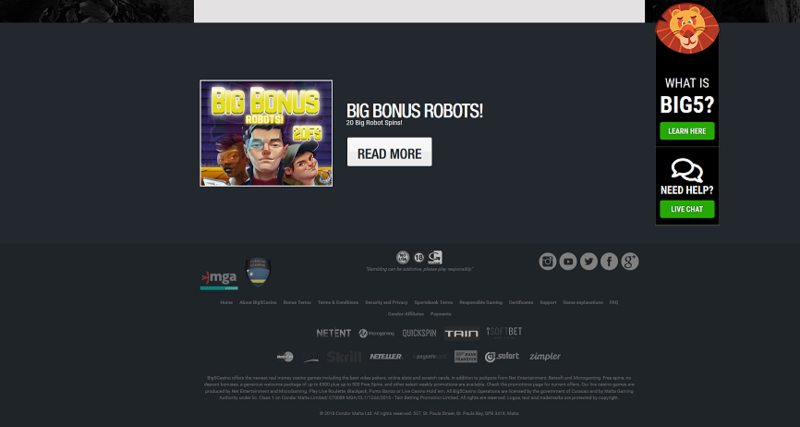 Big5 Casino Review: Claim 500 Free Spins and €500 Bonus! 88% of new players recommend this casino 46 new players chose this casino today! Big5 Casino is an online gaming site where you can play casino games for real money. Launched in 2015 and operated by Condor Gaming, the platform offers both virtual and live dealer casino games in addition to generous bonuses. The casino is licensed by Malta Gaming Authority and by the Curacao E-Gaming Authority. In addition, all their games have RNG certificates, which guarantees fair gambling. In this Big5 Casino review I’ll tell you everything you need to know before signing up. First, let’s take a look at Big5 Casino’s Welcome Bonus. It is a 100 percent cash match that goes up to €500. In other words, it doubles your first deposit! To trigger the bonus, deposit at least €20. 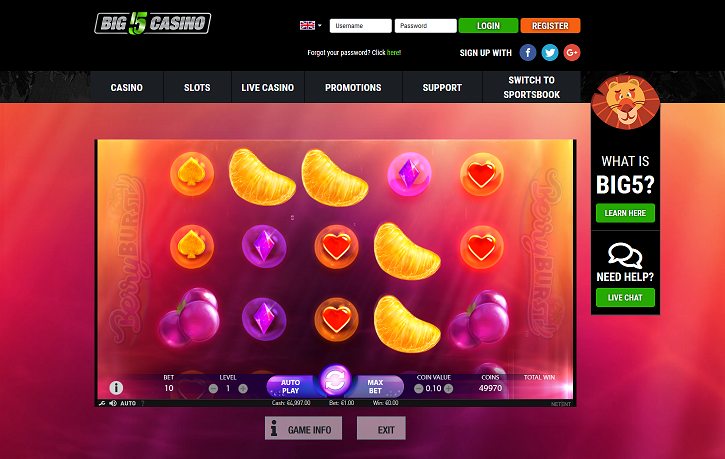 However, if you deposit €55 or more, you get 500 free spins in addition to the extra money. Join Big5 Casino’s VIP Program! The loyalty program at Big5 Casino is fun and innovative. Also, it is the reason behind the casino’s name. Well, the term represents five of the most famous mammals in Africa: buffalo, leopard, rhino, elephant, and lion. These are the giants adored by people from all around the world. Which one is your favourite? Big5 Casino chose these mammals to represent five loyalty tiers. Achieve them by playing games and collecting points! Each level has different perks and rewards. And when you reach the Lion tier, you become a VIP member who gets personalized bonuses. 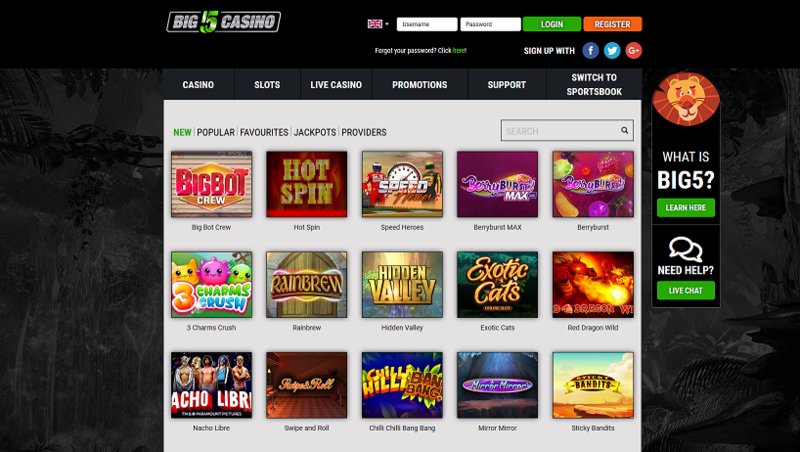 As Big5 Casino is a user-friendly site, you can find all the games with just a few clicks. In total, there are more than 400 different games by NetEnt, Microgaming, BetSoft, TAIN, Quickspin, and iSoftBet. The slots machines have a few sub-categories like new, popular, favourites, and jackpots. You can also see all the games by developer. In addition to rare gems like these, Big5 also has all the popular games the majority of gamblers enjoy. Here, you’ll find Finn and the Swirly Spin, Aloha! Cluster Pays, Starburst, and Northern Sky. Got tired of slot machines? If so, open any of the casino’s other sections filled with card and table games. The page is available in the following languages: English, German, Norwegian, Swedish, and Finnish. As there are lots of online casinos that don’t offer live games, I was pleasantly surprised to find out that Big5 has not one, but two different live casinos. One is developed by Microgaming and the other - by NetEnt. Scroll through their games and choose the one that appeals to you the most. Interact with your live dealer and see the outcomes of the cards or the roulette ball in real time. It comes as no surprise that Big5 Casino has a neat mobile version. Play all kinds of casino games on your Android or iPhone and have a great time no matter where you go. However, not all games are available when you access the site on mobile. At the moment, there is no Big5 Casino app available for download. There are a few ways to contact the customer support at Big5 Casino. You can either fill in the support contact form or write them an email. There’s also a live chat available seven days a week at 12.00 CET - 24.00 CET. Additionally, VIP players (Lions) get phone support. Big5 Casino is a great gaming page that has everything a gambler needs. You will especially enjoy its fun loyalty program and bonuses. The selection of games is impressive, ranging from simple slots to live dealer games. Join Big5 Casino today and have a great time, both on your PC and mobile phone. There are many deposit options on Big5Casino. You can choose the most convenient one for you. You can find the Terms & Conditions of the casino HERE.